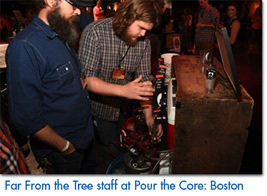 Event producers, Starfish Junction Productions, recently brought America’s historic beverage to the home of the American Revolution with Pour the Core: A Hard Cider Festival – Boston. 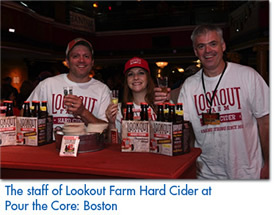 On Saturday, September 12, 2015 over 1,500 cider enthusiasts and casual consumers gathered at the Royale in Boston’s Theatre District to try and explore within the world of hard cider. Over 75 ciders from more than 30 represented companies poured their product, shared their expertise, and spent their time with the crowd during two sessions of cider-filled fun. With local favorites, such as Downeast Cider, Far From the Tree Cider, and Lookout Farms, nationally recognized names such as Woodchuck and Angry Orchard, newcomers like Sonoma Cider and even international brands such as Maeloc, Rekorderlig, and Aspall, every attendee had the chance to have their fill of tried-and-true favorites while sampling some previously-unseen ciders that are sure to be their go-to soon enough. “It was such a wonderful atmosphere within the venue as all cideries and attendees were having a great time experiencing this one-of-a-kind event where it hasn’t been before,” said Lynda Calimano, Vice President of Marketing at Starfish Junction. 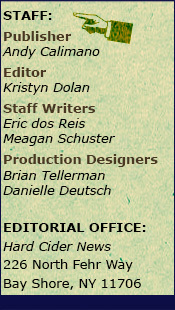 “We’re excited to hear the feedback from our attendees, and are ecstatic to have heard such great things thus far! We’re grateful to have had the opportunity to bring this festival into another great city with such a great turnout,” Calimano continued. For those who were not able to make the inaugural Massachusetts celebration, don’t worry! Pour the Core is making its way through the Northeast, making stops soon on Long Island and in Philadelphia. On Saturday, October 3 take the trip to Calverton Links in Calverton, New York for Pour the Core: Long Island, featuring Long Island locals Po’Boy Cider and Woodside Orchards for its fourth annual celebration. Just a few weeks later, on Saturday, October 17 at the Philadelphia Navy Yard, the third annual Pour the Core celebration heads back to Philly, this year featuring cysers (a mead and cider blended beverage) as well as cider favorites! Whether you’re a seasoned cider veteran, or are just now getting into the cider game, Pour the Core is a great way to spend a Saturday and entertain your taste-buds with new flavor combinations and libations. For additional information, visit PourTheCore.com. Photos courtesy of Karl Mischler. Over the past several years, there has been a surge in the popularity of hard ciders. Teavana’s innovative take on this trend includes loose leaf teas inspired by cider and infused with spices and dried fruits. 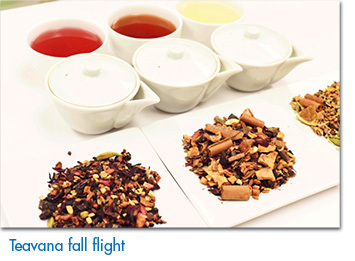 Every Saturday and Sunday from now through October 18, Teavana stores in the United States will offer a complimentary “flight” or samples of the cider-inspired teas, for customers who wish to taste them side by side. Those who purchase one pound of any tea cider or cider combination, will receive a 20 percent discount from participating stores. In addition to the complimentary tea cider flight, customers may try individual samples of Spiced Apple Cider through October 18, while supplies last. Poached Pear Cider – The most subtle flavor of the tea cider collection, the new Poached Pear Cider is a nuanced blend of pear with citrus, lemongrass and soft spices. “We wanted to create a tea with the taste of an epicurean dessert, similar to the poached pear that you find in French cuisine. 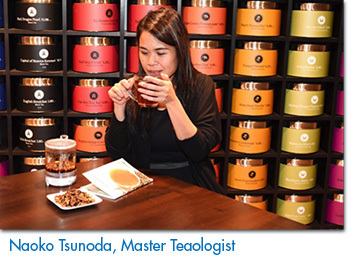 White hibiscus adds a bright flavor to the medley of sweet apples, cinnamon, cardamom and cloves, “said Tsunoda. Photos courtesy of Starbucks. 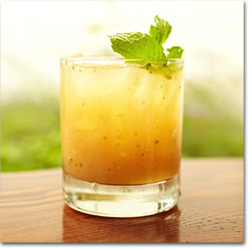 Visit Teavana.com for more information and to order tea ciders online. It was a reunion of sorts for Gregory Hall as the owner of the Michigan-based hard cider company, Virtue, announced that he would be selling a 51% stake of the company to the Anheuser Busch subsidiary Goose Island Beer Company. 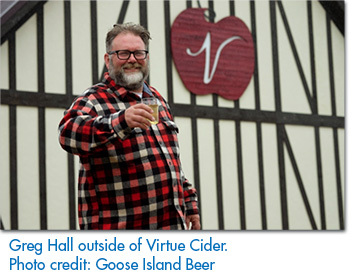 Hall, the once Goose Island brewmaster, started Virtue Cider in 2011 after the Anheuser Busch purchase of his family’s Goose Island Beer Company became final. Although Goose Island will now hold a controlling share of Virtue Cider, day to day operations won’t be changing much as Hall and co-founder Stephen Schmakel will continue to be the creative and operational team behind the business and will continue producing Virtue Cider in Fennville, Michigan. Virtue Cider has been producing cider for over four years and is a creative outlet for Gregory Hall’s innovative brewing methods. The company has created a portfolio of heavily focused barrel aged ciders including their flagship brand RedStreak, a proper English style cider and The Mitten, one of six traditional farmhouse blends that Virtue ages in one of the largest barrel programs in North America. Virtue has more than 700 oak barrels in Fennville, including French oak, American oak and bourbon barrels. Virtue Cider sold about 15,500 cases of cider in 2014, with Red Streak accounting for 34% of total production. Hall told Peter Frost of Crain’s Chicago Business recently, “For the last couple of years, we have been hitting our head on the ceiling on the amount of cider we can deliver. When we got into this in 2011, we had high hopes for Virtue and cider, but nobody had any idea it was going to grow in the way it did. Demand has far exceeded our ability to keep up with supply.” Virtue will seek to expand but will first take care of its existing markets. While the terms of the sale and agreement have not come to light, one thing is for sure, Virtue Cider will be rolling out plenty of new cider and many more enthusiasts will now have the ability to sample the prestigious beverages. For now, in states which Virtue does not distribute, curious palates will either have to patiently wait or visit the Michigan tasting room for samples of the craft cider. Virtue operates a bottle shop at Virtue Farm in Fennville, where cider drinkers can tour the cider house and get a tasting of all the ciders. For more information on Virtue Cider or Goose Island Beer Company, visit VirtueCider.com or GooseIsland.com. Prickle Me Pink has a 6% ABV and uses 100% fresh-pressed NW apple juice and California whole prickly pear. 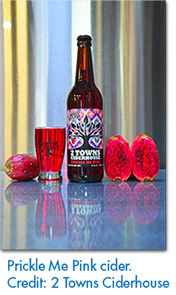 The fruit is naturally dense in color and lends the cider a hue that borders on neon. The cactus fruit can be found throughout the arid western states. Although the fruit is edible, the spines found on the outside of the fruit make it a formidable feat to forage. Prickle Me Pink is now available in the 2 Towns Ciderhouse Tap Room and to distributors in bottles, 1/6 bbls. kegs and 1/2 bbls. kegs. 2 Towns Ciderhouse ciders are available on Oregon, Washington, California, Alaska, Idaho, Hawaii, Chicago and parts of Nevada and Minnesota. 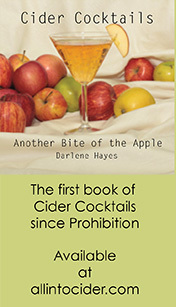 For additional information, please visit: 2TownsCiderhouse.com. 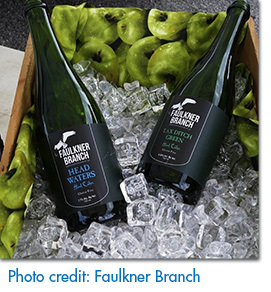 Recently the first hard cider tasting room in Caroline County and the only cidery on the Eastern Shore of Maryland arrived as Faulkner Branch opened their doors. Lynda and Stephen Blades began Blades Orchard in May 2008, and this past spring they expanded to welcome the cidery and a tasting room at the orchard which officially opened in May 2015. Distilling is the next frontier for the Blades. Licensing and permit approval is currently underway and production will likely start in 2016. Faulkner Branch at Blades Orchard is located at 4822 Preston Road, Federalsburg, Maryland. For more information, visit FaulknerBranch.com or call 410-829-0334. 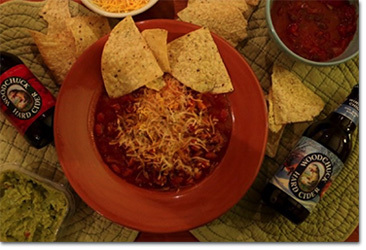 Faulkner Branch is open from 12pm – 4pm each Saturday and Sunday for tastings and purchases. SHIPcider.com, Oregon’s first online craft cider store, launched this week in Portland. The company will feature Pacific Northwest craft cider prominently among its vast array of cider from around the world. The site will carry dozens of craft ciders and meads from California, New York, Michigan, Colorado, Washington, New Zealand, England and France. Additionally, Oregon ciders featured on the site will include 2 Towns Ciderhouse, Anthem, Reverend Nat’s, Apple Outlaw, Portland Cider, Bull Run, Wildcraft, and Nectar Creek Meadery. Highlights of the online retailer service include 10% discounts on full-case orders, themed pre-mixed gift packs (also discounted), an order-by-phone option, custom orders and greeting card and gift wrap options. As SHIPcider.com continues to roll-out, the company will also be offering canned cider which will carry a more attractive shipping rate. 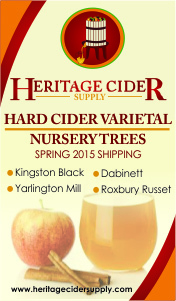 New ciders are continually being added to the site for purchase. New adds this week include Schilling Mischief Maker Pomegranate, Seattle Cider Gin Botanical and Three Pepper, Eden Ice Cider, and FinnRiver Forest Ginger. The company currently ships to 23 states and the District of Columbia. 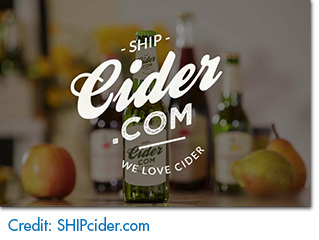 For additional information, please visit SHIPcider.com or to place an order call 844-SHIP-YES. From Magners for their 80th Anniversary celebration!